FlipShare is a boon to Flip video camera users. Just plug your camcorder into your PC or Mac USB port and the software will allow you to view your recorded video, edit and even share your video clips with friends and relatives via email or with the rest of the world by uploading them to YouTube, MySpace and AOL video, among others. Among the editing features made available by FlipShare are add music, titles and of course trim your video and even grab snapshots from it. Despite its versatility, there’s one feature many users are deprived of from employing – the rotate feature. How would you rotate a video you shot in a vertical mode in your flip camcorder when FlipShare doesn’t allow you to do that? The best way to do it would be to export out your video and use video editing software that has the rotate feature. If you are worried about incurring expenditure on the purchase of a video editing program, rest easy. If you’re a PC user, you could use Windows Movie Maker, which comes bundled with Microsoft Windows to fulfill your wish. Windows Movie Maker has the rotate feature that could address the shortcoming in FlipShare. However, there’s a problem importing flip video into Windows Movie Maker. This is because Flip video comes in the MP4 format. Windows Movie Maker doesn’t accept the MP4 format. So, in order to rotate your flip video in Windows Movie Maker, you would have to convert it to the WMV format first. In order to do this, you would need a video converter. Of course there are many versatile video converters out there. However, if you don’t feel like forking out cash for one, you could put to use a free option. One conversion program that would do the job for you is Super, a freeware that rivals video conversion programs you would fork out cash for. 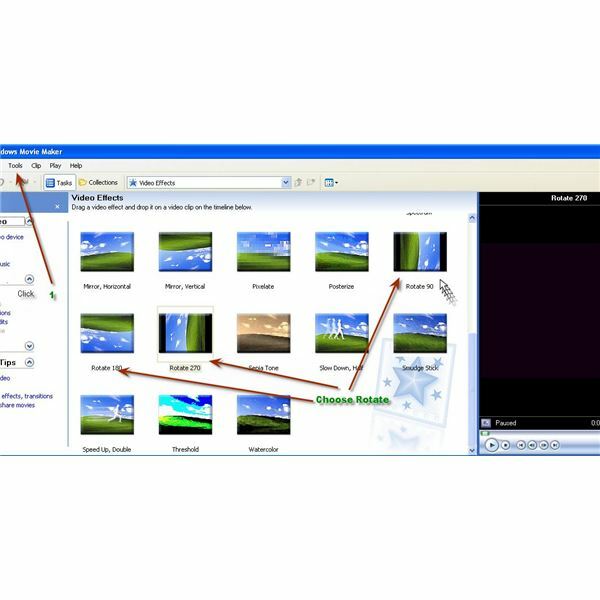 After converting your flip video to WMV, you would want to import your video into the Windows Movie Maker timeline. Once you have done that, you can select Tools from the top menu and then choose Video Effects. You would see the preview of the rotation on the player window to your right. Under Video Effects, you could rotate the video according to your desired angle as shown in the screenshot. If you don’t fancy installing a video converter program or working with Windows Movie Maker you can use Free Video Flip and Rotate which is a fully functional freeware program which you can download from here. Free Video Flip and Rotate supports the import of MP4 files. After you have chosen the desired rotation angle, all you would have to do is hit the convert button and your flip video will be rotated.